Indian investigators are now clear that the deadly 26/11 attacks were masterminded with active backing of the establishment in Pakistan. The role of three Pakistani Army officers � Major Iqbal, Major Sameer Ali and Major Abdul Rehman Hashmi � has already been established and their names are in a chargesheet filed by the National Investigation Agency in a Delhi court. The interrogation of Sayed Zabiuddin Ansari, alias Abu Hamza, alias Abu Zindal, has revealed that at least four more Pakistani Army officers were part of the Mumbai terror plot. Hours after reports emerged that Pakistan was to free Indian death row prisoner Sarabjit Singh, the presidential spokesman clarified that authorities had taken steps for the release of another Indian prisoner named Surjeet Singh who has been jailed for three decades. The talks between the foreign ministers of India and Pakistan, which were to be held in Islamabad in mid-July, have been postponed. However, the development has nothing to do with the arrest of Syed Zabiuddin Ansari, alias Abu Jundal, one the key plotters of the Mumbai attack. 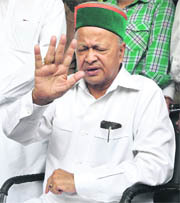 A day after a Shimla court ordered that charges be framed against him in a corruption case, Union minister Virbhadra Singh resigned from the Cabinet today, putting a question mark on his political future in his home state Himachal Pradesh where he is seeking a sixth term as chief minister in the year-end assembly polls. After a series of successful liver transplants at the Army�s Research and Referral (RR) Hospital in New Delhi, the Armed Forces Medical Services (AFMS) is now planning to introduce pancreatic, lung and intestinal transplant procedures in its establishments. Over 13,000 detonators and one tonne explosives were recovered and seven persons, including three who are suspected Maoists, were arrested in Ranchi district, police said today. On a tip-off, police raided some places at Tupudana on the outskirts of Ranchi and recovered the explosives last night, Senior Superintendent of Police Saket Kumar Singh told reporters here. 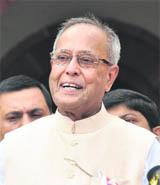 When UPA presidential candidate Pranab Mukherjee stepped out of his North Block office for the last time today and drove to Prime Minister Manmohan Singh�s residence to submit his resignation as the country�s Finance Minister, it was the last time that he would undertake this journey.